One of the most common oral health issues that people face today, is that of an abnormal bite. Also known as an ‘occlusion’, an abnormal bite refers to the way that the teeth in your upper jaw fit together with the teeth in your lower jaw, which may result in teeth misalignment . The molars at the top of your mouth should neatly overlay the ridges and valleys of your bottom molars. 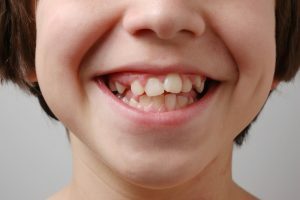 Class 1: This is the most common and occurs when the bite is normal, but the lower teeth are slightly overlapped by the top teeth. Class 2: When the teeth in the upper jaw overlap the bottom jaw and teeth. This is more commonly known as an overbite. Class 3: This class is most often referred to as an underbite. As the name suggests, it occurs when the lower jaw protrudes, which results in the upper jaw and teeth being overlapped by the lower. To establish which class you may fall under, we perform a routine exam. We may ask you to bite down, surveying how well your teeth align when they come back together. If there are any underlying issues, you may need to have some x-rays taken to determine a more thorough diagnosis. Once we have determined which class your abnormality falls under, a course of treatment can then be prescribed. However, because very few people live with perfectly aligned teeth, most problems are minor and do not require treatment. Removal of teeth: If overcrowding is contributing to your alignment issues, then you may need to have some teeth removed. Braces or other headwear: braces or Invisalign may be used in some patients to correct an abnormal bite. Repair: Rough or irregular teeth can be adjusted through reshaping or capping processes. Surgery: Jaw reshaping surgery may be an option for some very rare cases. This works to stabilise the jawbone using wires, plates or screws. Why Treat an Abnormal Bite? Treating an abnormal bite can help to prevent a number of other issues, including tooth decay, the irritation of the mouth and gums, possibly leading to gingivitis, and even problems with speaking and chewing. When treated early, teeth alignment issues are quicker, easier and less expensive to treat. This makes it important to consult your dental practitioner as soon as possible, as treatment works best in children and adolescents.